Dr. Chen graduated from the University of Wisconsin Medical School in 1998. At the University of Colorado Health Sciences Center in Denver, CO, he completed an Internal Medicine Residency in 2001, a Nuclear Medicine Fellowship in 2003, and a Cardiology Fellowship in 2006. He is currently completing a Cardiovascular Magnetic Resonance Imaging Fellowship at the National Institutes of Health (NIH), National Heart, Lung and Blood Institute (NHLBI) in Bethesda, MD. He has both clinical and research interests in multimodality and tomographic cardiac imaging (nuclear, CT, and MRI). Dr. Chen had research support from a NIH Training Grant and the Gilbert S. Blount, M.D. Clinical Research Scholarship while he was at the University of Colorado. 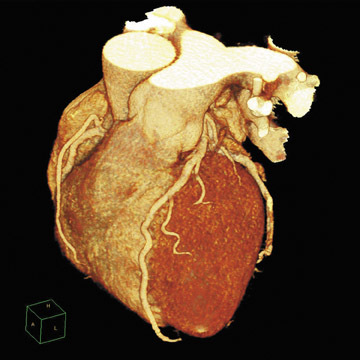 With recent rapid technologic advances in multislice computed tomography (CT), cardiac CT has emerged as a promising noninvasive imaging modality for the assessment of coronary artery disease (CAD). Current-generation CT scanners can quickly and accurately identify obstuctive coronary lesions or exclude disease in patients without known CAD. Even though large clinical trials are needed, the current indications for the assessment of CAD with cardiac CT are expanding and include the initial evaluation of chest pain in properly selected patients. Coronary artery disease (CAD) remains the number-one cause of death in the United States; in 2003, it accounted for 1 of every 2.7 (37.3%) deaths. 1 The traditional noninvasive approach to detecting CAD is stress testing. Stress testing provides physiological evidence of the hemodynamic consequences from flow-limiting stenoses through characteristic changes on the electrocardiogram, myocardial perfusion defects, or regional wall motion abnormalities. 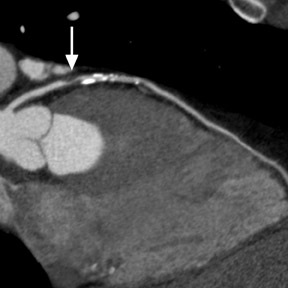 Cardiac CT is a rapidly emerging technique for the noninvasive visualization of coronary arteries. It is an attractive alternative to invasive selective coronary angiography with the potential to reduce the number of purely diagnostic cardiac catheterizations. Electron beam CT, which was developed in the early 1990s, pioneered cardiac CT with coronary calcium assessment and initial work in coronary angiography. However, the relatively low spatial resolution (1.5- to 3-mm slice thickness) limited its applicability, especially with contrast-enhanced coronary angiography. During the past 5 years, rapid technologic advances have progressively improved the diagnostic accuracy of multidetector CT (MDCT) for the detection of CAD. 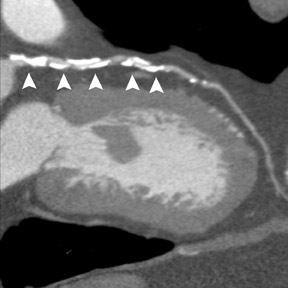 Clinical application of 4-slice coronary CT angiography (CTA) was limited because of a substantial number of nonevaluable segments (up to 43%), limited resolution, and a long breath-hold (approximately 45 seconds). 3 Multidetector CT with 16 slices has been shown to have an improved diagnostic accuracy for the detection of significant stenosis because of an increased temporal and spatial resolution, shorter breath-hold time (approximately 25 seconds) and a lower percentage of nondiagnostic segments. 4-11 The introduction of contemporary 64-slice technology with very short image acquisition times (<12 seconds), gantry rotation times of 330 msec, and isotropic spatial resolution of 0.4 mm have further improved the diagnostic performance of cardiac CT. Although the spatial and temporal resolution of cardiac CT is less than conventional invasive coronary angiography (spatial resolution of 0.25 mm and temporal resolution of 5 msec), 12 it is sufficient to evaluate CAD (Figure 1). Table 1 summarizes the results of recent results of coronary CTA using the latest generations of 16, 40-, and 64-slice CT scanners in consecutive patients scheduled for invasive coronary angiography 4-11,13-19 These single-center studies describe the findings of experienced observers in relatively small numbers of patients (50 to 100) with a relatively high prevalence of CAD. Additionally, patients were preselected and were excluded if they had a history of renal failure, arrhythmias, intolerance to beta-blockers, prior known CAD, or unstable angina. For the detection of significant stenosis (>50%), sensitivity ranged from 82% to 99% and specificity ranged from 95% to 99%. The percentage of nonevaluable coronary segments was low (between 0% and 12%). The uniformly high negative predictive value (97% to 100%) is one real strength of cardiac CT, as it reliably rules out the presence of significant CAD (Figure 2). The diagnostic accuracy that can be expected among lower-risk patients or with less-experienced observers is not known. 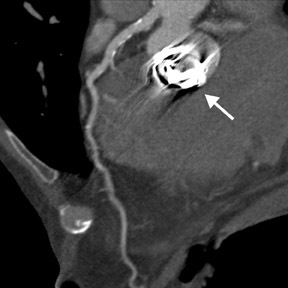 However, continual improvements in scanner technology and imaging protocols should enhance the diagnostic accuracy of cardiac CT.
Cardiac CT evaluation of the coronary arteries has important advantages because of its noninvasive methodology, speed, reliability in excluding severe CAD, and simultaneous acquisition of other chest structures, such as the aorta and pulmonary arteries. However, there are significant limitations. Coronary artery visualization by CT is challenging because of the small size and rapid motion of the coronary vessels. Since multiple studies have shown that image quality is inversely related to heart rate, 7,17,20 beta-blockers are routinely utilized to achieve a slow heart rate (optimally <65 beats/min) and minimize blurring or motion artifact. In order to prevent misregistration artifacts from irregular heart rhythms, patients with atrial fibrillation or frequent ectopic beats are usually excluded. Additionally, patients must be able to sustain a breath-hold for at least 12 seconds to avoid respiratory motion artifacts with 64-slice CT. 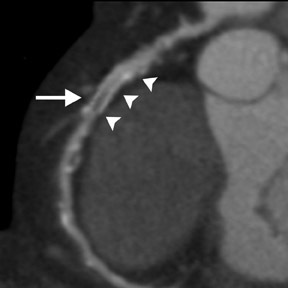 Even with 64-slice scanner technology, dense-calcification-induced partial-volume effects, beam-hardening, or blooming artifacts continue to be a frequent cause of impaired image quality that may lead to nonevaluable coronary segments or misdiagnosis (Figure 3). Chest pain is one of the most common complaints of patients evaluated in an ambulatory setting. The pretest probability of CAD can be determined based on guidelines 25 and estimated as very low, low, intermediate, or high risk based on age, gender, and clinical symptoms. Patients with a very low or low likelihood of CAD should not have any further diagnostic testing because of the small prevalence of disease. Stable patients with a high pretest probability of obstructive coronary disease or known CAD should have stress testing to assess for physiological evidence of flow-limiting stenoses. 26,27 Patients with unstable angina and a high pretest probability of obstructive coronary disease should proceed directly to invasive coronary angiography for definitive diagnosis and potential therapy. 28 Noninvasive evaluation with cardiac CT is not indicated in such high-risk groups, since it would delay therapy and would not provide additional diagnostic information. Symptomatic patients with intermediate (10% to 90%) pretest risk of CAD clearly benefit from further diagnostic testing. The screening for CAD with contrast-enhanced cardiac CTA in asymptomatic individuals of all risks is not indicated based on the lack of any clinical data regarding its significance, prognosis, or cost-effectiveness. Cardiac CTA, which reliably excludes the presence of significant CAD because of its high negative predictive value, is a diagnostic option for the assessment of chest pain syndromes in selected patients with intermediate risk. Since exercise stress testing offers a wealth of prognostic data, is more widely available, and is less expensive than cardiac CT, patients who have an interpretable electrocardiogram (ECG) (for determining stress-induced ischemic changes) and are able to exercise should undergo exercise stress testing. However, if the patient does not have an interpretable ECG or is unable to exercise, cardiac CT is an appropriate noninvasive diagnostic option to detect obstructive CAD or to exclude its presence. Additionally, cardiac CT may be useful for the assessment of CAD if a patient has had other prior diagnostic testing that was either equivocal or uninterpretable. Approximately 60% of diagnostic invasive coronary angiograms do not lead to further coronary interventions. 1 Following a prior equivocal or nondiagnostic evaluation, a cardiac CTA that excludes the presence of disease will decrease the number of patients who require cardiac catheterization for diagnosis. Only those patients with significant disease detected by cardiac CTA would potentially proceed to invasive coronary angiography for therapy. Therefore, cardiac CTA may decrease the number of "normal" diagnostic cardiac catheterizations. Analogous to the outpatient evaluation of chest pain syndromes, further noninvasive diagnostic testing (including cardiac CT) for the presence of CAD should not be performed on patients with low or high pretest probability of CAD. In the absence of ischemic ECG changes and abnormal serial cardiac enzymes, cardiac CTA may be used to further evaluate patients who are at intermediate risk for CAD. 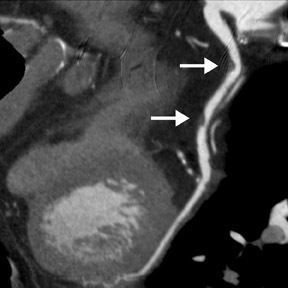 Cardiac CT through the rapid exclusion of stenosis or plaque may facilitate early triage and decrease the number of hospital admissions for patients with acute chest pain. Unfortunately, no studies to date have utilized cardiac CT for the evaluation of intermediate-risk patients with acute chest pain. However, Raff et al 35 have reported that cardiac CTA in the ED can exclude CAD as the cause of low-risk acute chest pain in less time (length of stay 12.5 versus 22.1 hours, 43% reduction) and at a lower cost ($1586 versus $1872, 15% reduction) than standard-of-care stress myocardial perfusion imaging. 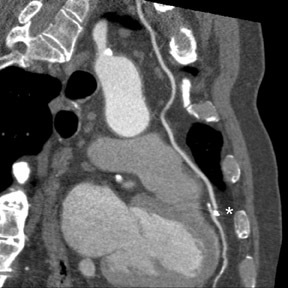 Contrast-enhanced chest CTA angiography is well established clinically for the rapid evaluation of pulmonary embolism and aortic dissection. 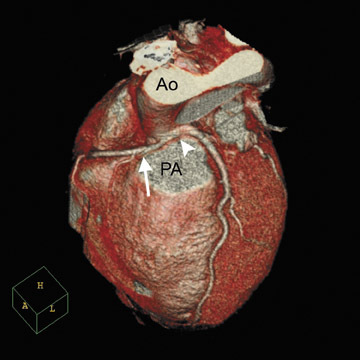 The fast volumetric coverage with MDCT enables combined imaging of the coronary arteries, the ascending aorta, and the pulmonary arteries to assess for presence of CAD, thoracic aortic dissection, and pulmonary embolism within a single CT examination. This "triple rule-out" imaging protocol requires an extension of the field of view to include the entire chest and the administration of a greater volume of intravenous contrast material to ensure the adequate contrast enhancement of both the pulmonary and thoracic aorta vasculature. An initial study using 16-slice MDCT found the feasibility of a comprehensive "triple rule-out" protocol for evaluating cardiac and noncardiac chest pain in stable emergency department patients. 36 As compared with 16-slice scanners, 64-slice MDCT has dramatically shorter image acquisition time, which results in a higher probability of obtaining a diagnostic study that is free from respiratory or heart-rate variability reconstruction artifacts. Congenital anomalies of the coronary vessels are rare and affect approximately 1% of the general population. 37 However, such anomalies may have clinically significant consequences, including with myocardial ischemia, fatal arrhythmias, or sudden death. 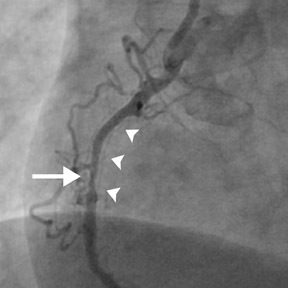 The risk of sudden death is increased in patients in whom the proximal segment of an aberrant vessel has a malignant course and is compressed between the aorta and pulmonary artery typically during exercise (Figure 4). For patients who are known to have CAD, guidelines recommend further evaluation for those who experience a significant change in symptoms. 25 With the exception of the evaluation of bypass grafts and, possibly, coronary stent patency, cardiac CT has a very limited role in the evaluation of recurrent symptoms in patients with known CAD. However, functional studies, such as myocardial perfusion imaging or stress echocardiography, are indicated because of their ability to identify at-risk myocardium and associated prognostic information. After coronary artery bypass graft (CABG) surgery, chest pain is common and can have a variety of etiologies, including recurrent angina secondary to graft occlusion, sternal infection, pleural or pericardial effusion, and less common but potentially lethal complications, such as pulmonary embolism or pseudoaneurysm formation. In this clinical setting, cardiac MDCT can offer a rapid, convenient, and noninvasive modality for determining the correct underlying diagnosis. Image acquisition should include the entire thorax to visualize the origin of the internal mammary artery and, therefore, involves a longer scan time with additional intravenous contrast. Specifically for graft occlusions, saphenous vein grafts have a 1-year angiographic patency rate of 84%, which progressively decreases to 61% at 10 years. 48 Internal mammary arterial conduits have higher patency rates with 95% at 1 year and 85% at 10 years. 48 Since bypass graft patency is limited, follow-up examinations are likely. Unlike native coronary arteries, bypass grafts have large dimensions, less calcification of lesions, and minimal motion, which facilitate coronary imaging. CT evaluation of bypass graft patency was first reported in 1980 but was of limited value. 49 Current-generation cardiac MDCT scanners have a high sensitivity (96% to 100%) and specificity (99% to 100%) for the evaluation of bypass graft patency (Figure 6). Table 2 summarizes the results of several prospective studies that have examined the accuracy of MDCT for detecting graft patency or significant stenosis (>50%) in patients who had previously undergone CABG and were scheduled for invasive coronary angiography. When compared with assessment of graft patency, detection of graft stenosis (Figure 7) had a lower sensitivity (82% to 100%) and lower specificity (89% to 96%) with a higher percentage of non-evaluable segments (5% to 15%). Similar to the assessment of obstructive CAD in native coronary vessels with cardiac CT, evaluation of bypass grafts also has a high negative predictive value (94% to 100%) for either graft occlusion or significant stenosis. Cardiac CT, in properly selected cases, can provide important clinical information on the status of bypass grafts without the risk of vascular complications that are associated with invasive angiography. Additionally, cardiac CT may provide 3D detail for surgeons to precisely plan a repeat sternotomy in redo-CABG patients and avoid trauma to intact grafts or other cardiovascular structures. 55 Further clinical studies to examine the effects of cardiac CT evaluation of bypass grafts on clinical outcome or clinical management are warranted. The rate of restenosis following the implantation of a bare metal stent is relatively high, 56 and the distinction between in-stent restenosis and residual or new coronary artery stenosis may be difficult using traditional noninvasive stress testing. Coronary stents are visualized with cardiac CT; however, image quality is often impaired with incomplete evaluation or artificial narrowing of the stent lumen due to beam-hardening and blooming artifacts caused by the high-density stent material. The stent type, strut design, material, and diameter can significantly affect the ability of cardiac CT to assess the stent lumen. 57-60 The sensitivity of cardiac CT for the detection of in-stent restenosis will be limited by small-diameter stents, heavy segment calcification, or poor stent expansion. Cardiac CT for follow-up after stent placement is promising. Currently, this indication is under investigation, and further studies are required before clinical recommendations can be made. Future stent designs, including biodegradable materials, are likely to be better assessed for instent restenosis by MDCT. Dual-source CT (DSCT) is a novel design that combines 2 arrays of an X-ray tube plus a detector that are arranged at a 90º angle. 63,64 Only 90º of rotation is required to obtain an attenuation data set when using an 180º scan reconstruction algorithm. Therefore, this DSCT scanner with a gantry rotation speed of 330 msec has a temporal resolution of 83 msec. Current-generation conventional single-source CT scanners have rotation speeds of 330 to 420 msec with a temporal resolution of approximately 165 to 210 msec using half-scan reconstruction. Therefore, DSCT scanners have the advantage of successfully imaging patients with higher heart rates. An initial feasibility study found that DSCT with a temporal resolution of 83 msec can effectively image the coronary arteries without the use of beta-blocker premedication to lower the heart rate. 64 In this small study of 14 consecutive patients with an average heart rate of 71 ± 13 bpm (range 56 to 91 bpm), only 2% of the coronary segments were unable to be evaluated because of motion artifacts. 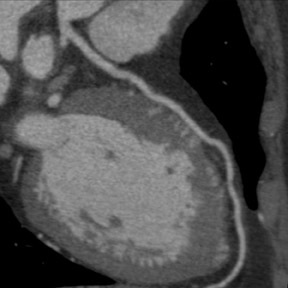 The improved temporal resolution of DSCT is expected to improve the accuracy of CAD visualization, detection, and quantification, since motion artifacts are a frequently encountered limitation for cardiac CT. Clinical trials that investigate the diagnostic accuracy of DSCT to detect or rule out CAD and the influence of heart rate on that diagnostic accuracy are warranted. As cardiac CT becomes more widely available and accepted, a greater proportion of symptomatic patients will be diagnosed with obstructive CAD based on MDCT findings, as compared with other noninvasive imaging modalities. Three-dimensional anatomical coronary information will be available in those patients with a prior CT who proceed with invasive angiography and percutaneous coronary intervention. Preprocedural assessment and identification of coronary lesion characteristics and selection of ideally sized interventional balloons and stents will likely enhance patient care with improved technical success, decreased invasive study time, and decreased contrast and radiation exposure in the cardiac catheterization laboratory. Cardiac CT is a rapidly developing noninvasive technology that can quickly and accurately identify or exclude significant obstuctive CAD in selected patient populations. Currently, cardiac CTA cannot broadly replace diagnostic coronary angiography; however, in certain clincial situations, it can be an alternative. Upcoming appropriateness criteria and guide-lines will help define cardiac CT indications for both clinicians and third-party payers. Large-scale prospective multicenter trials are needed to define patient groups in whom information obtained from cardiac CT will provide incremental value over available tests, improve patient outcome, and demonstrate cost-effectiveness. The clinical applications of cardiac CT will continue to widen and evolve as additional information is obtained through clinical trials and technological improvements. 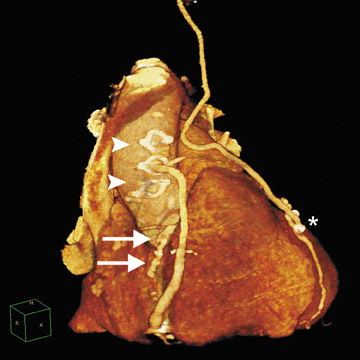 Coronary Artery Disease Assessment With Cardiac CT. Appl Radiol.